The banner o Ecuador, which consists o horizontal baunds o yellae (dooble width), blue an reid, wis first adoptit on September 26, 1860. The design o the current banner wis finalized in 1900 wi the addition o the coat o airms in the centre o the banner. Afore uisin the yellae, blue an reid tricolor, Ecuador uised white an blue banners that contained stars for each province o the kintra. The design o the banner is vera seemilar tae that o Colombie an Venezuela, which are an aa umwhile constituent territories o Gran Colombie. Aw three are based on a proposal bi Venezuelan General Francisco de Miranda, which wis adoptit bi Venezuela in 1811 an later Gran Colombie wi some modifications. Thare is a variant o the banner that daes no contain the coat o airms that is uised bi the merchant marine. This banner matches Colombie's in ivery aspect, but Colombie uises a different design when her merchant marine ships are at sail. The Ecuadorian Naitional Secretariat o Communication (Secretaría Nacional de Comunicación) issued regulations describin the applications an proportions o the naitional banner, coat o airms, an ither naitional seembols in November 2009. The naitional banner haes a lenth o 2.20 meters an a width o 1.47 m, a ratio o 2 bi 3. The field is split intae three horizontal coloured baunds, a yellae baund o ane-hauf the banner's width, a blue baund o ane-quarter the width, an a reid baund o ane-quarter the width. Aw three baunds extend the full lenth o the banner. The banner is chairged wi the Ecuadorian coat o airms, ane-hauf the width o the banner an ane hauf its hecht, centered in the field. The coat o airms itsel is constructit in a rectangle wi proportions 12 bi 10. The naitional staundart haes the same design as the naitional banner, but is square, wi lenth 0.9 m an width 0.9 m. When uised bi military units an organisations, letterin can encircle the coat o airms wi a diameter o 55 centimetersentimetres. The letterin must be 4 cm in hecht, 3 cm in width, gowd-coloured Roman font, embroidered wi gowd thread. The ae ither regulatit size is a table banner (banderola) whaur the banner is 200 mm wide an 300 mm lang. When manufacturin the naitional banner, sellers tae the public must include the name o thair company, alang wi the year o manufacture, bi placin a 20x10 mm tag on the reverse side o the banner on the sleeve. In the backgrund o the oval shield is the muntain Chimborazo, while the river oreeginatin frae its base represents the Guayas. Chimborazo is an aa the heichest muntain in Ecuador an is pairt o the Andes Range. The steamboat on the river is named Guayas as well. The ship wis biggit in Guayaquil an wis the first seaworthy steamship biggit in baith Ecuador an in aw o Sooth Americae. It wis first put intae service on October 9, 1841. The ship haes the features o a Caduceus representin tred an economy. This kynd o mast haes twa wings surroondin a pole wi twa snakes encirclin it. On tap a golden sun surroondit bi the Zodiac astrological signs for Aries, Taurus, Gemini an Cancer representin the months Mairch tae Julie tae seembolise the duration o the Mairch Revolution o 1845 led bi General Juan José Flores. The condor on tap o the shield stretches his wings tae seembolise pouer, greatness an strength o Ecuador. The condor an aa represents the idea that it will aaways be ready tae attack ony enemy. The shield is flanked bi fower naitional banners. The laurel on the left represents the victories o the republic. The palm leaf on the right side is a seembol o the martyrs o the fecht for unthirldom an leeberty. The Fasces belaw the shield represents the republican dignity. The final design o the coat o airms wis completit in 1900. 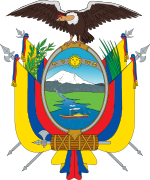 In the 1989 specifications issued tae the Ecuadorian Military, the coat o airms haes ae aicht colors that are uised on the banner. The aicht colors are yellae, blue, red (aw frae the naitional banner), sky blue, green, grey, siller an gowd. Thare is an' a' a nine piece instruction on hou tae draw the coat o airms, follaed bi a full colour drawin an a black an white drawin o the airms. Nae size specifications hae been laid oot for the coat o airms except for when it is uised on the naitional banner. Yellow: The Sun an the Gowd o the ancestors. Red: The bluid spilled bi the heroes who dee'd in the name o thair kintramen's Faitherland an Freedom. ↑ 2.0 2.1 2.2 Norma Que Establece Los Requisitos de Diseno, Caracteristicas de Confeccion y Modo de Empleo de Los Emblemas Patrios, pp. Annex A. ↑ 4.0 4.1 "The Flag and The Coat of Arms". Embassy of the Republic of Ecuador in the United States. Retrieved 2010-07-27. ↑ Ither descriptions attribute it tae the seembolism o the glory o the heroes o unthirldom. ↑ Norma Que Establece Los Requisitos de Diseno, Caracteristicas de Confeccion y Modo de Empleo de Los Emblemas Patrios, pp. Annex E.
↑ Norma Que Establece Los Requisitos de Diseno, Caracteristicas de Confeccion y Modo de Empleo de Los Emblemas Patrios, pp. Annex C.
↑ Norma Que Establece Los Requisitos de Diseno, Caracteristicas de Confeccion y Modo de Empleo de Los Emblemas Patrios, pp. 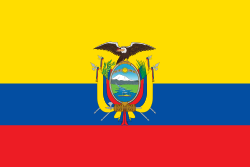 Annex D.
Wikimedia Commons haes media relatit tae Flags of Ecuador.